This work describes the optimization, validation, and application in real samples of accurate and precise analytical methods to determine ten fluoroquinolones (FQs) (norfloxacin, enoxacin, pefloxacin, ofloxacin, levofloxacin, ciprofloxacin, danofloxacin, lomefloxacin, enrofloxacin, and sparfloxacin) in different environmental matrices, such as water (estuarine, seawater, and wastewater treatment plant effluent), fish tissues (muscle and liver), and fish biofluids (plasma and bile). The analysis step performed by liquid chromatography-tandem mass spectrometry (LC-MS/MS) was fully optimized to improve the separation and detection steps. 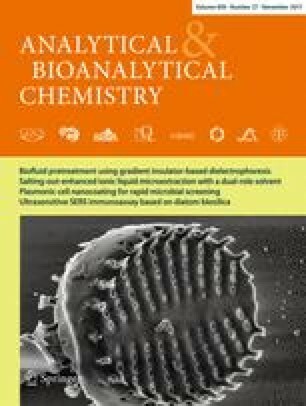 The extraction of analytes from fish tissues was accomplished using focused ultrasound solid-liquid extraction using methanol/acetic acid (95:5 v/v) as extractant. The preconcentration and clean-up steps were optimized in terms of extraction efficiency and cleanliness and the best strategy for each matrix was selected: (i) Oasis HLB for seawater and muscle, (ii) liquid-liquid extraction combined with Oasis HLB for the lipid-rich liver, (iii) the combination of Evolute-WAX and Oasis HLB for estuarine water and wastewater treatment plant effluent, and (iv) molecular imprinted polymers for biofluids. The methods afforded satisfactory apparent recoveries (80–126%) and repeatability (RSD < 15%), except for sparfloxacin, which showed a lack of correction with the available isotopically labeled surrogates ([2H8]–ciprofloxacin and [2H5]–enrofloxacin). Ciprofloxacin, norfloxacin, and ofloxacin were detected in both water and fish liver samples from the Biscay Coast at concentrations up to 278 ng/L and 4 ng/g, respectively. To the best of our knowledge, this work is one of the few analyzing up to ten FQs and in so many fish tissues and biofluids. Determination of fluoroquinolones in different environmental matrices, such as water (estuarine, seawater, and wastewater treatment plant effluent), fish tissues (muscle and liver), and fish biofluids (plasma and bile). This work was financially supported by the Ministry of Economy and Competitiveness through the project CTM2014-56628-C3-1-R and by the Basque Government through the project IT-742-13. H. Ziarrusta is grateful to the Spanish Ministry and L. Mijangos to the Basque Government for their pre-doctoral fellowships. EMEA. Committee for veterinary medicinal products, Enrofloxacin EMEA/MRL/820/02-FINAL. http://www.ema.europa.eu/ema/index.jsp?curl=pages/includes/document/document_detail.jsp?webContentId=WC500014151&murl=menus/medicines/medicines.jsp&mid=WC0b01ac058009a3dc (2002). Cited 28 Feb 2017. Application note for Biotage-AFFINILUTE™ MIP Fluoroquinolones. http://www.biotage.com/product-page/affinilute-mip-columns. Cited 28 Feb 2017.